They are free and will come to you by email every 3 days for the next 30 days. You may have seen some church greeter videos on this site, but I’ve added a few that are found only in this sequence and no where else. 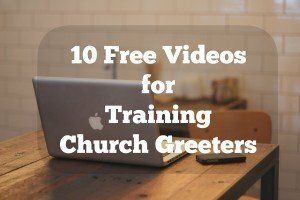 Yes, you can HAVE access all these church greeter training videos for free as they are rolled out. I’ve been studying and writing about church greeter training during the past 20 years and want to share this information with you, and I’m giving it all away for free. I want to help you church greeter ministry get launched, get organized and get started. . . . I ask you to sign up for them by email so that you will not be overwhelmed by all 10 at one time. I assure you I do not rent, sell, or share this email list with no-one. What six words do you not want a church greeter to say to a first time church visitor? How do you fix the three most common complaints about church greeter ministry? What are some suggested guidelines for church greeters? What is a church greeter and what do church greeters do? What are the duties of a church greeter? What needs to go into a church greeter training meeting? How do you develop and train a team of greeters at church? Do you have greeters in the church who don’t really know what to do? Were they a warm recruit to fill a spot? Or someone with the gifts to step in and do the job? What do you use for church greeter training? What Church Greeter tips can you share with your new recruits? All of these questions will be addressed on the inside, as you contribute your thoughts and hear these church greeter training videos. Most of these church greeter training videos are under 5 minutes each. Get in soon! Your Turn: So Your Church Greeter Stinks! You are welcome. I’ve updated them for 2014 and those who finish the series will get more new ones this year. But only those who’ve gotten the first 10 will get there.